Having a hard time deciding where to start? 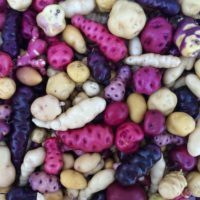 I recommend starting with the broad tetraploid mix, which will give you a lot of variety and tubers that are pretty easy to store and grow again. In general, tetraploid seeds will be easiest, followed by high dormancy diploids, and then mixed or low dormancy diploids.